Petrarch never sounded quite like this. Of course he didn't. For one thing, he was Italian. For another, he lived in the 14th century. 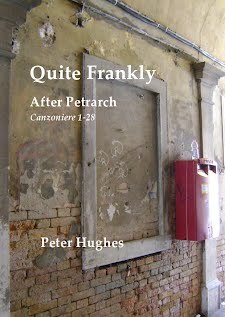 Peter Hughes has taken on, head-on, the twin impossibilities of poetry translation: the well-known one of language, and the lesser-acknowledged, but equally important, element of historical sensibility. It isn't just that the words and their subtleties shift irreconcilably between idioms, but also that the things we can say with them change, sometimes radically, over time. If we look at the above example, we can see this process in action. In the original, unsurprisingly, there's no 'hauling up' of energy, but rather a pair of occhi lassi - weary eyes. There's certainly no 'Christ help us', which would have been unconscionably blasphemous in 13-something, but there is the standard sospiro - sigh - of love. None of which is to say that, cliched as these images may appear to us, they didn't at the time convey a visceral sense of passion in conflict with existential frustration. Legend has it that Petrarch's muse, was married to someone considerably above the poet's social station - about as dangerous an amatory situation as they came. But of course, needing this information to make sense of it automatically puts the contemporary reader in academic, literary-historical mode. It's the perennial GCSE teacher's problem of making something archaic and overquoted appear fresh and (Christ help us) 'relevant.' And it's here that Hughes demonstrates something of genius, not merely by finding contemporary language to render the intoxication, despair, ambiguity and dead-ends of the Petrarchan subject-matter, but by deftly relocating it into a frame of reference which makes instant contemporary sense. The damage is the same; only the method changes between medieval Southern Europe and contemporary Eastern England. I'd even say that, for a non-medievalist whose Italian is as defective as mine, they're as good as the originals. That may be taken as a recommendation.